Effective fuel management is critical to get the best out of a wood burner and ensure its most environmentally friendly usage. Indeed, the volume of particulate matter in the atmosphere caused by wood burning depends far more on how the wood is burnt than the stove used to burn it. Particulates come from incomplete burning of wood (just think how much a bonfire gives off), but modern wood-burning stoves are highly efficient at guaranteeing complete combustion. The latest wood burning stoves are exceptionally good at ensuring as high a proportion of the particulates as possible are burned off before they reach the atmosphere. Even a 70% efficient wood burning stove will produce 200kg of carbon less than a 100% efficient electric fire because of the high carbon content in electricity. Modern stoves, however, generally achieve 80 to 90% efficiency so the carbon savings are even more impressive. But it is not just the efficiency of the stove itself that matters; the fuel used in the stove also has a significant bearing on efficiency. There are, for example, powerful reasons not to burn wet wood. It releases more potentially harmful particulates/air pollution into the air than burning dry wood. It produces less heat (because the energy is being used to burn the water off first). It takes longer to burn, again because the moisture has to evaporate first. And it creates more sooty deposits in the chimney, which could become a fire risk and will mean the stove needs maintaining more frequently. Freshly cut wood can have water content between 60 and 80% and if used in a stove will amount to boiling water. That’s why freshly felled timber needs to be cut and split into small logs and left to dry in a covered but airy store, before being used for 1-2 years. 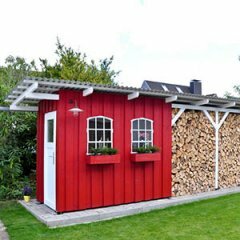 Kiln-dried wood has 20 to 25% moisture content and burns more efficiently. It’s also important that the fuel remains dry during transport or storage. Importantly, logs with 40% moisture content will produce 2.7kWh; logs with less than 20% moisture content will produce 5kWh. In a bid to encourage stove owners to buy suitably dry wood, the SIA has been working with Woodsure, the UK’s wood fuel accreditation scheme, and HETAS, as well as with the main suppliers of bagged logs, to create a brand called ‘Ready to Burn’. The Ready to Burn logo is designed to give consumers confidence that they are buying quality assured logs, guaranteed to have moisture content below 25% and ready for immediate burning. According to Bruce Allen, chairman of Woodsure: “Modern heating appliances are highly engineered, efficient pieces of technology that do a fantastic job – but they can only do so much without quality wood fuel. The government-backed Ready to Burn scheme is compliant with EU timber regulations and will set a benchmark for logs and other wood fuels in the UK to help with identifying wood that has been carefully chosen and ready to burn.